This one is a large cage feeder. After battling starlings in various feeder types, I have come to the conclusion that the only real way to keep starlings completely out of a feeder they want into is to put a cage around it. They are determined to get at the mealworms, which they obsess over, so they haven’t totally given up, but the reality is that the only mealworms they get now are those dropped by a smaller bird. They still come by a few times during the day to reach in for some spilled mealworms, but are nowhere near as active as they were before. When the feeder arrived, the little glass bowl and its holder was well wrapped separately inside the feeder. The holder attaches easily with a wheel-like thumb nut screw. No tools required. There is about 4 ½” of space from the outside edge of the bowl to the wire mesh – a distance too far for even the long-beaked starlings to reach. Smaller birds hop inside and usually sit on the side of the bowl to eat. I filled mine up with dried mealworms, adjusted the cable slide and hung it from the hook of one of my Erva baffles. (You could alternatively offer other things in the bowl; maybe jelly for orioles? Or you could offer live mealworms of course. 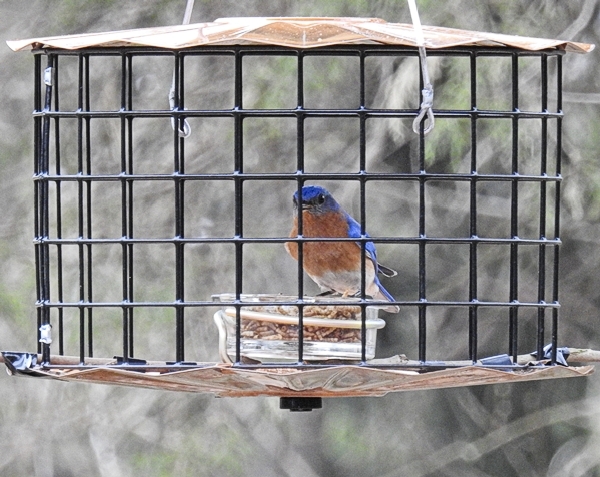 )I really hesitated to buy this feeder because some of the commenters on Amazon said that their Eastern Bluebirds couldn’t figure out how to get inside and/or they were too big to fit through the wire and I’d never seen the bluebirds in my yard go inside any of the cage feeders I already had. But the starlings were driving me and the bluebirds crazy, so I took a chance and I’m glad I did. It really was not a problem. 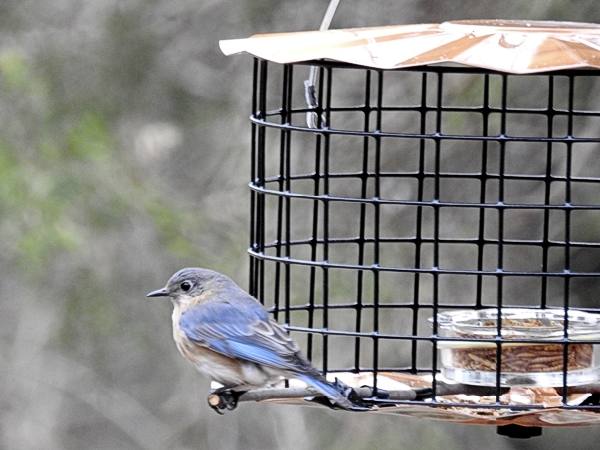 It took the bluebirds a few days to get completely used to the feeder, but the first one puzzled it out in less than an hour. One recommendation I saw in the Amazon comments was to add temporary perches to the feeder so the bluebirds have a comfortable place to sit while they think through how to get inside the feeder. So I used my trusty super strong Scotch Super 88 vinyl electrical tape to temporarily attach two perch-like twigs to the bottom panel of the feeder. I actually made the twigs a bit too long at first. If they are too long, a bird can land hard on the farthest point of the “perch” and the hanging feeder can move upwards in a lever or seesaw kind of action. This is disconcerting for a bird inside! So once I realized that, I got my pruners and trimmed the “perches” to a shorter 1 1/2” length. After the birds got used to going in and out for a couple weeks, I got rid of the perches entirely. Erva does sell a separate starburst-like wheel of metal perches that can be attached to the bottom of the feeder if you want permanent perches. 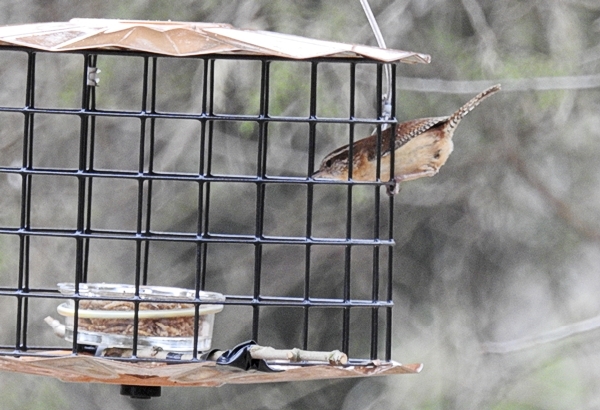 The very first bird to get inside was, not surprisingly, a Carolina Wren. 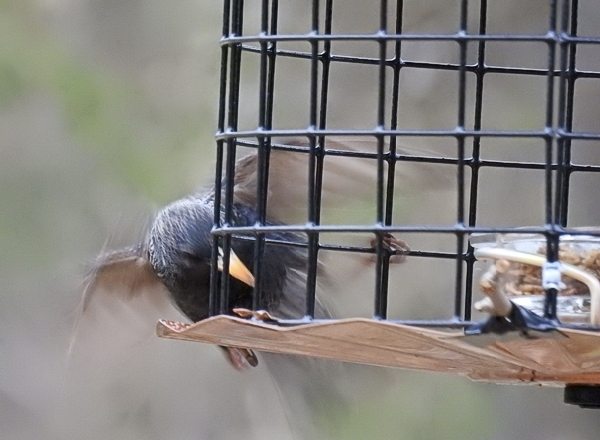 She flew right over and popped right through the bars to grab some mealworms. 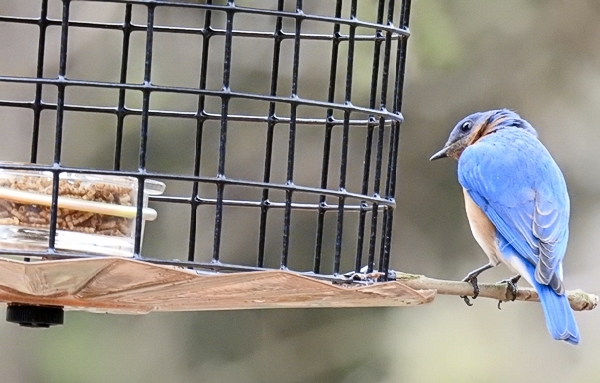 A pair of them are now regulars on this feeder (and had no need for the temporary perches.) They seem quite pleased with it. But I think bluebirds are smart. The four that are visiting the feeders in my yard each day have seen other birds hopping in and out of the three other cage feeders I have to offer sunflower hearts for weeks now. So I think they probably realized that I wasn’t trying to trap them. 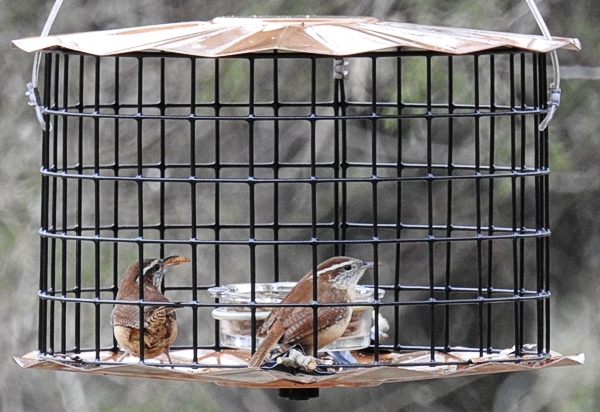 Once they saw the wrens going in and out of this feeder so easily, they decided to give it a try. 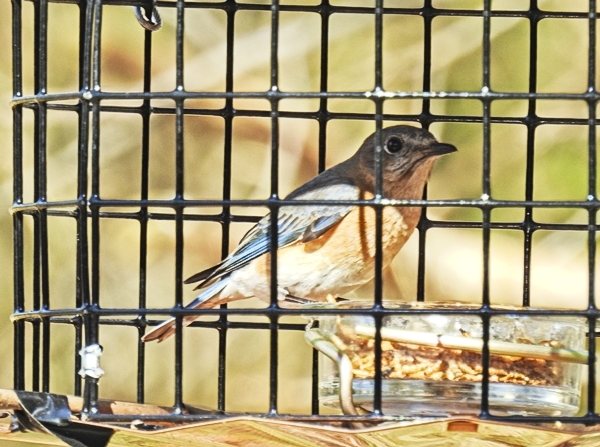 The first bluebird in the feeder popped in, went through, and immediately popped back out so fast that I wasn’t completely sure I had seen what I had seen. But he soon repeated the trick, this time stopping to sit on the edge of the bowl and eat mealworms. Once one bird in the group figures something out, others will follow their lead. Some of the others were a bit skittish at first, but within a day seemed cool with the feeder. Interestingly, now that the small birds can eat more of the mealworms and the starlings can only eat the fallen scraps, I am going through MUCH less mealworms. I had previously purchased a five pound bag of them from Amazon and went through almost all of it in a little less than a month. The little glass bowl’s interior dimensions are 3 1/4” wide by 1” deep. It holds about 3/4 cup of mealworms. The four bluebirds and two wrens currently eating them only go through about half of that in a day. (Update: After about a week, they were going through the whole bowl each day.) So the new bag I just bought is should last a lot longer! There are other small birds in my yard that eat mealworms too that I haven’t seen in the feeder yet, so that may change over time. So far the only other bird I’ve seen in it was a Pine Warbler. The Starling Proof Feeder line that Erva sells is pretty interesting. The basic feeder design of the two metal plates and the wire mesh seems to be standard for all six feeders in this line. The difference in the feeders is the color and the inner food dispenser. 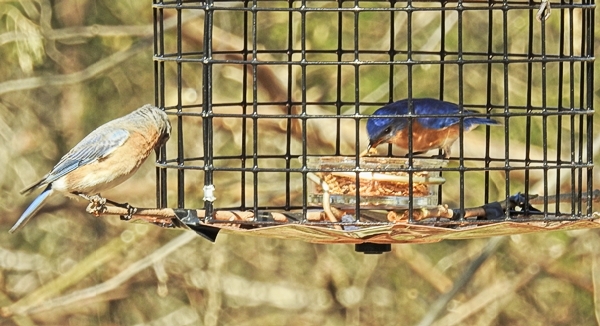 They offer two mealworm feeders with a glass bowl in the middle, one in copper color like I have and the other in blue. 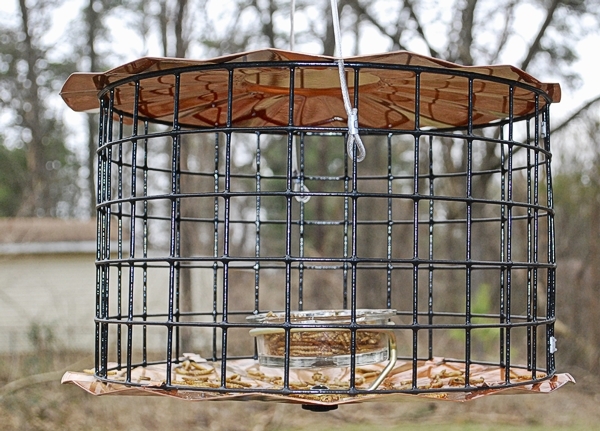 Then they also offer other copper color versions with either a spike for a seed cylinder or a mesh tube for peanuts or sunflower seed or a double suet cake basket. The final feeder is a green version of the suet feeder. If you go on the Erva website, you can alternatively purchase these interior pieces separately so it looks like you could change the purpose of the feeder this way. Pretty cool. It has only been in use a few days, but so far this feeder is working beautifully. The bluebirds and wrens seem very happy with it and the starlings are no longer eating and fighting over dried mealworms. This was not an inexpensive feeder, but it is well made and should last a long time. I suspect that I’ll make back the feeder cost in savings on dried mealworms that aren’t going into starling bellies. Update: After about two weeks, I still like this feeder. The starlings have not completely left it alone though. They can’t reach into the bowl itself, but bluebirds and wrens can be a bit messy when they eat, sometimes flinging the dried mealworms around a bit, leaving a few closer to the metal mesh. A couple times a day, a starling will come by and hang on the side of the feeder and reach in with its beak to grab whatever spilled mealworms it can reach. So they are not 100% locked out, but more like 90% locked out. They don’t stay long and I no longer have groups of them bickering over the mealworms for long periods of time though and the bluebirds and wrens can eat in peace, so it is much better.